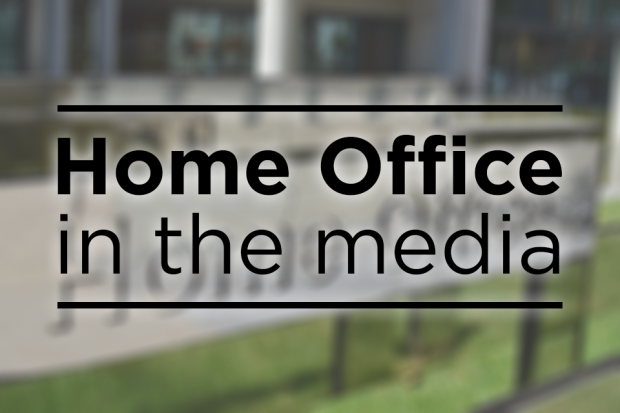 The Telegraph and Mail report on the joint announcement yesterday by the Home Office and Department for Exiting the European Union on how the UK’s proposed settled status scheme will operate. The Mail reports that international criminal record checks will not be carried out routinely on those who are hoping to stay after Brexit and that EU citizens will instead be screened against UK police and security databases. The Telegraph reports that EU citizens will face tougher deportation laws, with those sentenced to a year or more in jail being removed from the UK. There is more information on the announcement on gov.uk while a comment from the Home Secretary can be found below. The Times carries a story in its T2 supplement on the work of the Counter Terrorism Internet Referral Unit (CITRU) which is funded by the Home office and based in the Metropolitan Police’s Counter Terrorism Command Centre. The feature reports on the work of CITRU and how it has removed 300,000 pieces of terror propaganda from the internet. It also carries interview with staff members on how the unit works to help keep the public safe. Members of the public can report online material promoting terrorism or extremism on gov.uk.